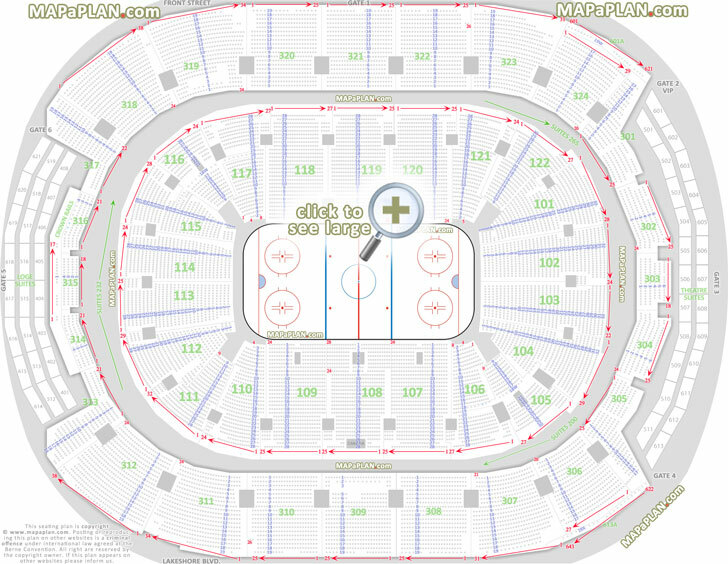 What are the best seats in the Toronto Air Canada Centre? In concert the end-stage configuration the best seats in the Toronto Air Canada Centre (sometimes referred to as The ACC or The Hangar) are the front rows in floor sections. Floor rows are typically numbered 1-46. Rows further back OK however all floor seating is set on a flat floor so if a tall person is sitting (or standing) in front of you the view may be slightly obstructed / restricted. Floor seats are numbered from 1 up left to right. 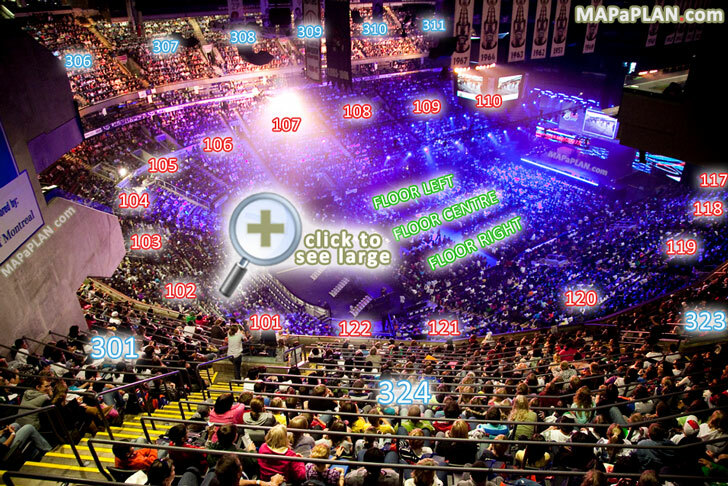 Check out the seating charts on this page to locate seat numbers as close to the centre as possible for an optimum central view of the stage. Surrounding the floor are lower bowl (level 200) and upper bowl (level 300). These tiered seats offer great concert views as well, especially sections 108, 109, 107 118, 119, 120. 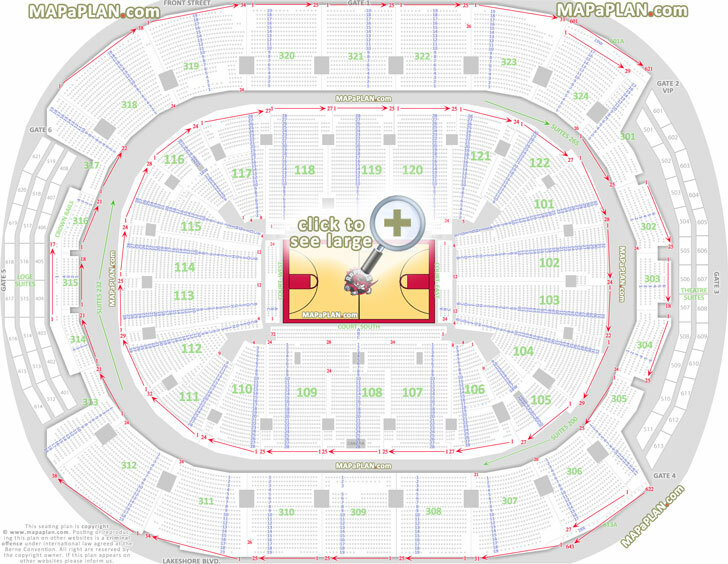 Sections 108 and 119 have actually the best seats for Raptors basketball, Maple Leafs hockey or Rocks lacrosse games as they are positioned at the center of the court / rink. 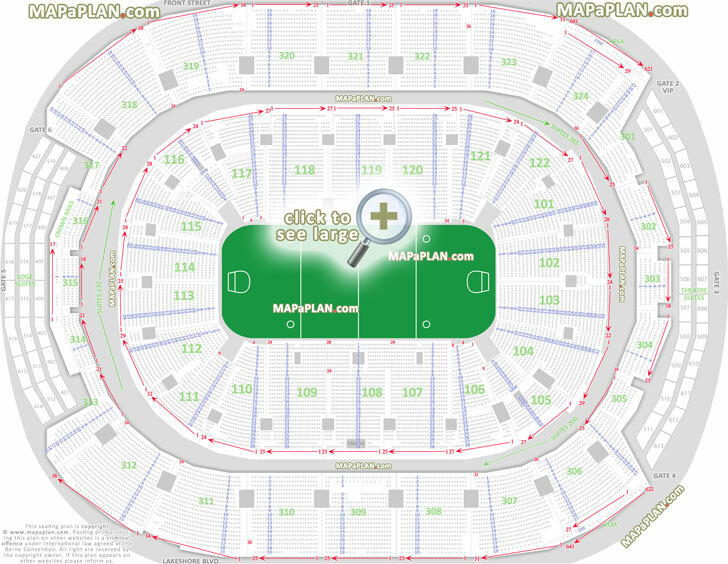 In the lower and upper bowl sections, seat #1 is always closer to the section with a lower number. 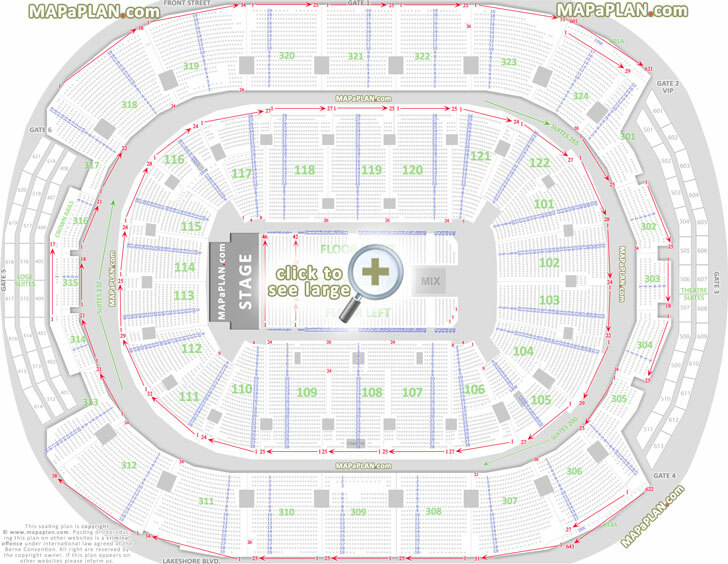 This means that for example in the end stage configuration in order to be as close to the artist try to pick seats with a lower number in section 118 or with a higher number in section 109. The rows are typically numbered from 1 upwards. Although backline sections may have additional front rows lettered B-H.
What are the section numbers in the Toronto Air Canada Centre? How are the rows numbered in the Toronto Air Canada Centre? The rows in the flat seating sections are ordered in numerical order with each of the floor sections (Left, Centre, Right) having rows starting from row #1 up to #50 maximum. 100s (lower bowl) have rows from 1 up to 32 maximum. 300s (upper bowl) have rows from 1 up to 19 maximum. What are some of the biggest acts that will be performing or have performed in the Toronto Air Canada Centre?